This is the second class time of working on this project. During the first week we discussed abstraction & looked at images of abstracted animals...as well as examples of birds depicted in Native American work. During our second class time, we reviewed the color wheel & analogous colors. 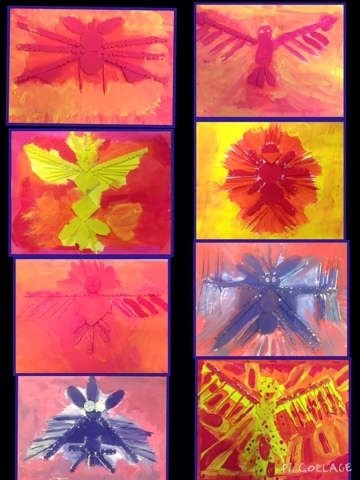 Students selected their colors and painted their birds. We plan to spend a partial class using black to add definition to their images. This project is hit & miss for me. Some of the students are really doing some interesting things...while others are just mixing their colors all together into one(even though we discussed this prior to painting). I'm hoping the black saves the day!! Stay tuned...I'll be sure to share.